A building that came about in many phases with a former FORT and LIGHTHOUSE and CITY TOWER. Both objects were restored during 1974-1980. The facility was finally delivered on September 15, 1983. 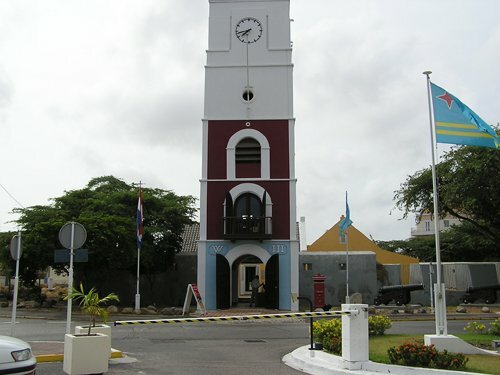 In 1796 the “Comité Militaire” (Army Committee) founded in Curacao with acting governor Johan Rudolf Lauffer as civil captain, to construct forts on each of the three Leeward Islands in connection with the international political instability of the time. Fort Zoutman was built alongside the Paardenbaai to withstand water based as well as land based attacks and should help in case of internal insurrection. The Fort was finally completed around 1798 and was named after Admiral Johan Arnold Zoutman. The land destined for the construction had to be leveled; a stone wall was erected at the south, behind this it was filled with dirt. The Southside was about 0.5 meter higher than before and was used as a protection from enemy fire. A guardroom, barracks, storage, a kitchen and water tank was erected at the North side close to the main gate. The Southern part was paved. The design of the fort is unusual because of its rectangular shape and the unique shaped fortifications (bastions) from which military could flank the walls from enemy fire. It had gun holes with four light cannons on the western side of the fort, covering the harbor. The gun holes covered the front of the fort on the country side; the embrasures with cannons served to defend the port. The wall to the North side could be flanked by the central bastion with the left and right part. On both sides of the fort on an angle, similar projections could be found to flank the fort walls in South West direction. Also the moats (ditches) in the wall on a little distance from the right side of the tower served the flanking fire; ditto the moats (ditches) in the opposite wall. The fort could have had up to 35 gun holes; Mr. J. Hartog counted a total of 31 before 1974. The main entrance was located where the Willem III tower is located at present, on the opposite wall was a small opening often used as an escape route. The south wall was the only defense on that side. The walls date back to 1936. The fort with its guardroom, barracks and storage were found to be in a deplorable state. Restoration began under orders of Commander Simon Plats in 1826. The fort lost its garrison during the period of 1830-1834. One sergeant and five corporals of the Colonial Constabulary brigade were encamped there in 1859. Prison cells were built in that year inside the fort against the eastern and western walls, eliminating some of the embrasures and gun holes. An arrow mark was introduced at the western wall in 1909 when Captain J. Lens, by orders of the Dutch government, performed topographical measurements for the first topographical card of Aruba in 1912. The lighthouse - Willem-II tower - built in 1868 at the main entrance on the West side of the fort, on request of lieutenant governor J.H. Ferguson in 1866 to the Governor of Curacao in order to place a town bell. The decision was made to build a lighthouse where the bell could be placed at the same time and where the time could be shown on the hour (this happened until 1933). The tower was named after William III, King of the Netherlands, and was lit for the first time on his birthday, February 19, 1868. Bowlike openings allowed the necessary possibility of passage under the tower. The first construction layer of the tower functioned as entrance to the fort. The tower housed a police station with watch post. A wooden structure was erected in the back of the tower in connection with the first floor, used then as sleeping quarters. In 1937 this was raised and it was replaced by a concrete structure. The tower consisted of only four floors in 1868. On top of the fourth floor there was an octagonal structure for the kerosene lamp. The octagonal lamp was replaced by a wooden helm roof between 1885 and 1900. In 1930 Antoine van Meeteren put a high stone structure on the place of that cap. The kerosene lamp had been previously replaced by a two pit petrol lamp (an old example of the California Lighthouse) and in 1930 by an acetylene lamp. The tower received electric lighting in 1935 and in 1937 it obtained the form it has until today. The changes were made by orders of lieutenant governor I. Wagemaker. The tower received a fifth floor segment with a town bell on each side. The wooden floors were replaced by concrete floors. The new bell was ordered at Petit & Fritsen (Aarle-Rixtel). The wooden balcony was replaced with a balcony with concrete floor. The lamp was then still situated in one of the corners. In 1963 it was taken away and the tower lost its function as a lighthouse. For more information about this building you can contact the Monument Office.